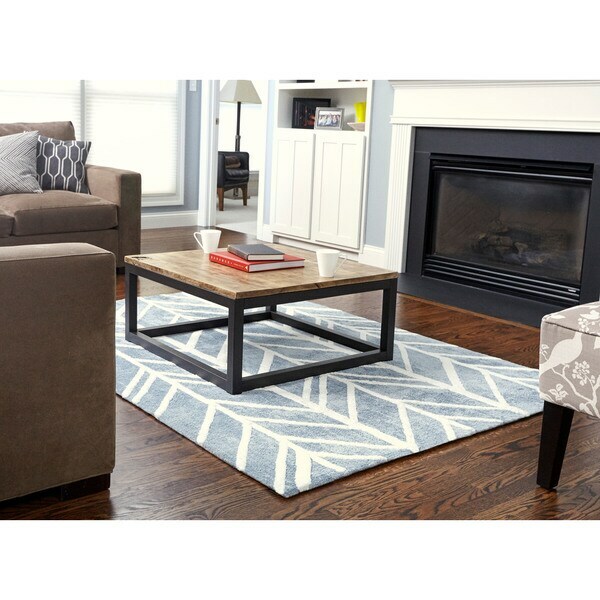 This rug is perfect for our family room. The blue color is a nice accent to the mostly gray/neutral colors in the room and matches a farmhouse / beachy theme. The Adi rayon from bamboo viscose 8 x 10 area rug features an over-tuftedgeometric design in a color palette of blue and ivory. Silky softand irresistible to the touch, rayon from bamboo viscose provides both shimmerand softness for an alluring proposition. If other rugs on this site are of this quality I would never purchase anything on here again. The ends are unfinished. The white pattern sticks out above the rest of the carpet and you feel these big bumps as you walk over the rug. Came with the white part of the design discolored in places. Seems like it will fall apart in a few months. It's beautiful but I thought it was more light blue in real life than it appears in the picture. It's super soft on your feet, but it's important to know the white stripes on the rug are slightly raised from the rest of the rug. So our vacuum catches on it at times. Style and made of bamboo. I do not buy wool because it is unethical.